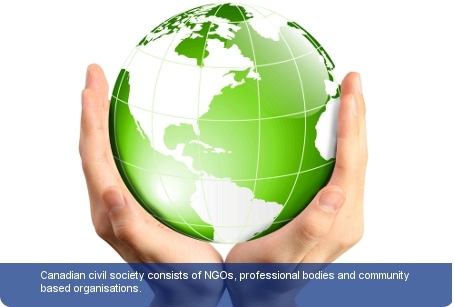 Canadian civil society consists of NGOs, professional bodies and community-based organisations. Canada has 55,000 registered non-governmental organisations (NGOs) attracting the participation of over five million Canadians. A small proportion of them are international NGOs. International NGOs, often substantially funded are mostly involved in providing overseas emergency relief, development assistance in projects, development education, and in policy and advocacy. In terms of fundraising CARE, World Vision and Planned Parenthood are recognised as the most successful. In addition to this, the Canadian International Development Agency (CIDA) is responsible for the country’s development assistance. The domestic NGO community is involved in many sectors of Canadian society such as social care; health; education and environmental conservation. Notable examples include the Canadian Cancer Society, Canada Family Action Coalition, Canadian Environmental Network and the Canadian Federation of University Women. There are no legal definitions of NGOs or CSOs in Canada. The Canada Corporations Act broadly categorises NGOs/CSOs as not-for-profit corporations for funding and tax purposes, and also to prohibit members from receiving any pecuniary gain. That said, NGOs are allowed to function without obtaining status of a legal entity and without registration. The Canadian Labour Congress (CLC) makes up the different unions and labour organisations. Canada accommodates two main trade unions within the CLC: The Canadian Union of Public Employees (CUPE) and the United Food and Commercial Workers (UFCW).